Point Pleasant libero Peyton Jordan returns a Nitro serve as teammate Olivia Dotson (10) looks on during Tuesday night’s Class AA sectional tournament volleyball match in Point Pleasant, W.Va.
POINT PLEASANT, W.Va. — Early on, it was more tricks than treats for the Point Pleasant High School volleyball team. Soon enough, however, Lanea Cochran and the Lady Knights— on Halloween of all nights — began to put the spook into the Nitro Lady Wildcats. 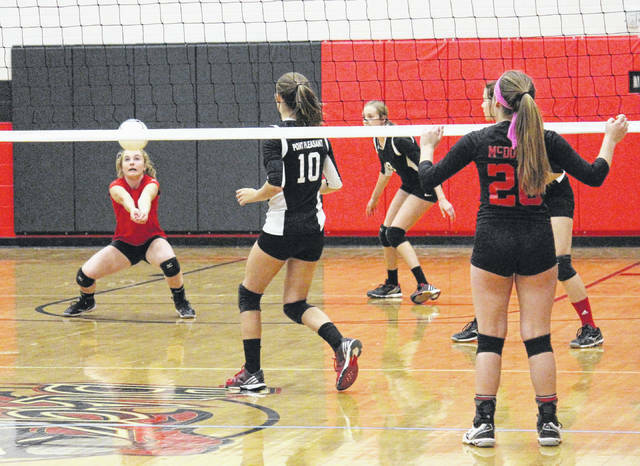 As a result, Point Pleasant pushed forward in its 2017 season for at least one more day, rallying to defeat the visiting Wildcats 23-25, 25-21, 25-19 and 25-15 in a Class AA Region 4 Section 1 tilt on Tuesday night. Truth be told, the second-seeded Lady Knights resembled and had that look of zombies for the opening game-and-a-half, going down one-game-to-none before finally taking an 18-17 advantage in the second set —their first lead of the entire match. But from there, the Lady Knights never trailed again, actually outscoring the Wildcats 61-38 after falling behind 17-14 in the second game. With the win, Point Pleasant pushed its impressive record to 19-3, and more importantly, remained in the winners’ bracket of the Region 4 Section 1 tournament. The Lady Knights needed just one match on Tuesday before moving on to play Winfield, the top-seeded squad in the double-elimination sectional — and whom they faced on Wednesday in the winners’ bracket final. The Lady Generals — who are responsible for two of Point Pleasant’s three defeats this season — were set to play PPHS at 5 p.m., then a potential rematch for the sectional championship at 9 p.m. While the winner of the 5 p.m. bout returned to play at 9 p.m. for the sectional title, the loser dropped into the losers’ bracket final at 7 p.m. The losers’ bracket winner would then return to play the winners’ bracket winner for the championship. While Nitro fell to 21-16 with the loss to the Lady Knights, third-year PPHS coach Marla Cottrill knew what her club was in for. The Lady Knights needed the full five games to top the Wildcats on Sept. 19, and by defeating Sissonville in four games on Tuesday before facing Point Pleasant, third-seeded Nitro was already at it — and caught the Lady Knights stuck in the starting blocks. Nitro never trailed in the opening set, leading by five three times at 6-1, 9-4 and 17-12. While Point Pleasant — plagued by all sorts of errors early on — rallied for ties of 17-17, 19-19, 20-20 and 21-21, the Lady Wildcats won the opening set 25-23. In the second game, the Lady Knights notched a 2-2 tie, but soon fell behind by counts of 8-3 and 12-8. But that’s when the standout middle hitter Cochran caught fire, and began a kill spree to turn the tide the Lady Knights’ way. “Nitro had just played four sets, so they were already warmed up and ready to go. We were coming out of the locker-room cold, and Nitro took us to five sets when we played them in the regular season. So we knew they were a good team. But we had looked at film, we told the girls to hit where the holes were at and fortunately they started to do that. And with the way Lanea (C0chran) was hitting…when she is on, Lanea is on,” said Cottrill. That she was, amassing a match-high 12 kills, as she also amounted four solo blocks with two assisted. Olivia Dotson’s eight kills and four aces added suit, as did Brenna Dotson’s nine kills and two blocks. Brenna Dotson, Gracie Cottrill and libero Peyton Jordan each served up a pair of aces. Cottrill and Olivia Dotson set for 18 and 11 assists respectively, as Jordan led in digs with 19 while Dotson dug up 16 balls. It was actually Cochran’s fifth kill of the second game that earned the Lady Knights a sideout down 17-15, as four straight service points by Jordan — on three Nitro errors and a Brenna Dotson kill —pushed Point into the lead at 19-17. A Sydney Murray kill and an Anna Welch ace tied the set two points later, but the Wildcats would not tie nor even come closer the rest of the way. A service error set up the second game point, which Cochran claimed for her sixth and final kill of the set. In the third game, Cochran captured kills on two of the first three points, then collected kill-blocks for three consecutive points to make it 15-6 after a Nitro attack error. The Wildcats won four straight points to make it 15-10, but the Lady Knights scored six of the next seven for their largest advantage at 21-11, en route to the 25-19 triumph. The Lady Knights also scored the initial three points of game four, then opened up a 9-3 cushion with five straight after a lift got the Wildcats to within 4-3. They would get no closer, though, as although Nitro did trim the deficit to 10-8 and 11-9, the Lady Knights netted four straight points — part of 12 of the next 16 for their largest lead at 23-13. Olivia Dotson’s fifth kill of the set, followed by a Jordan ace, ended the match. Coach Cottrill quickly turned her attention to Winfield, which was —as of Wednesday —the Lady Knights’ highest mountain in the Mountain State all season. “With Winfield, as long as we play our game and don’t get down, we’ll be okay. We keep saying Winfield is our Mount Muhammad. That’s the one we want to beat, and hopefully we will this time,” she said.